Interviewers often mistakenly give higher ratings to job job seekers – whom they interview early in the day – at the expense of other applicants. That’s one of the conclusions from research of 10 years of data from more than 9,000 MBA interviews. The study was conducted by Uri Simonsohn of The Wharton School of the University of Pennsylvania and Francesca Gino of Harvard Business School, and released in 2013. It was published in Psychological Science, a journal of the Association for Psychological Science. “People are averse to judging too many applicants high or low on a single day, which creates a bias against people who happen to show up on days with especially strong applicants,” according to the researchers. They indicate interviewers have a difficult time seeing the big picture. 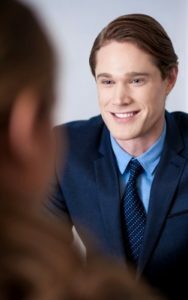 Instead of evaluating applicants in relation to all of the applicants who had been or would be interviewed, interviewers would only consider them in the frame of applicants interviewed on that day. Much like gamblers bet on red after the wheel stops at black four times in a row, an interviewer bets on “bad” after interviewing four “goods” in a row. The difference in this case is that the interviewer controls the wheel. If the interviewer expected that 50 percent of the whole pool would be recommended, the interviewer would avoid recommending more than half of the applicants interviewed in a given day. As predicted, interviews earlier in the day had a negative impact on the assessments for the interviews that followed — if the interviewer had already given several high scores, the next score was likely to be lower. This held true even after various applicant characteristics and interview characteristics were taken into account. As the average score for previous applicants increased by .75 (on a 1-5 scale), the predicted score for the next applicant dropped by about .075. This drop may seem small, but the effect is meaningful. An applicant would need about 30 more points on the GMAT, 23 more months of experience, or .23 more points in the assessment of the written application to make up for the drop. Additionally, the impact of previous scores grew stronger as the interviewer progressed through the day. In case you’re wondering, yes, the study results are applicable in other situations – from bankers considering loan applicants to reality-show producers choosing contestants. So interviewers beware of your potential unintended bias. Applicants, schedule interviews no later than 10 a.m., but 9 a.m. is better. The study’s results aren’t a surprise to me personally as I’ve always believed in meeting early in the day – as I’ve sought new clients – or early in my career when I was seeking employment. — Mornings were considered prime time. I’ve always preferred client meetings in the morning. Prior to my consulting practice, I preferred job interviews early, too. I inherently realized that morning was prime time for making money. In most cases, if a potential client or employer wouldn’t commit to an early meeting, it was not a good sign. If at first you don’t succeed … skydiving is not for you.